Every lawn needs constant maintenance and proper nourishment throughout the year to ensure that it stays healthy. Fertilizing is a huge part in getting your lawn the proper nutrients it needs to grow and stay green. How do you get the most out of your fertilizer? Check out these essential tips in making sure that your fertilizer will be effective in helping your lawn! Every bag of fertilizer will have three numbers listed on the front of it. These numbers indicate the percentage of nitrogen, phosphorus, and potassium in the fertilizer. Nitrogen will always be the first number, phosphorus the middle number, and potassium the last number. Nitrogen is the most vital nutrient for your lawn because it helps with grass growth and in keeping your lawn green. Phosphorus is important to have with newly planted lawns, but isn’t as needed later on. Potassium will help with increasing your lawn’s stress tolerance. Out of these three, nitrogen is the most important, so you’ll want to look for fertilizer with a high percentage of nitrogen. With nitrogen being the most important, you’ll want to make sure your fertilizer has between 30-50% of nitrogen. However, it’s important to make sure that the nitrogen is insoluble, meaning that it is slowly released to your lawn. Quick release of nitrogen will limit the equal growth of your lawn and make it weaker. When nitrogen is released gradually, then your lawn will grow in equally and a lot stronger. Make sure you are applying your fertilizer regularly and know when you should be applying more or less. 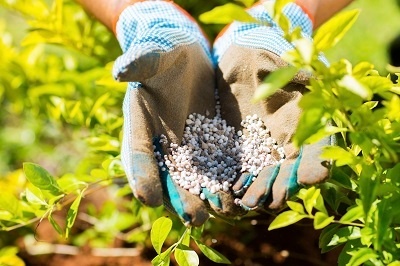 It’s best to apply fertilizer lightly in the spring and heavily in the fall. You’ll always want to apply fertilizer throughout the summer to ensure that your lawn is still getting nutrients in the heat. Read about even more tips in properly fertilizing here! As helpful as fertilizer is, it is still a pollutant and needs to be applied with care. We wouldn’t want it getting into any water reserves or lakes. Check out tips on safely applying and handling fertilizer here. Fertilizing is just one of the important things you should be doing to keep your lawn healthy. Want to know what else you could be doing? Download our FREE DIY Guide to learn about more good lawn care practices for the summer. Just click the button below to get your copy today!